ABC: THE GOLDBERGS aired its first new episode since April 11, and dropped 0.1 to 1.2. ALEX INC was at 0.8, compared to last week’s 0.7/0.6. Also returning for the first time in 3 weeks, MODERN FAMILY fell 0.2 to 1.2, and AMERICAN HOUSEWIFE lost 0.2 to 0.9. DESIGNATED SURVIVOR gained 0.1 from last week to 0.6. 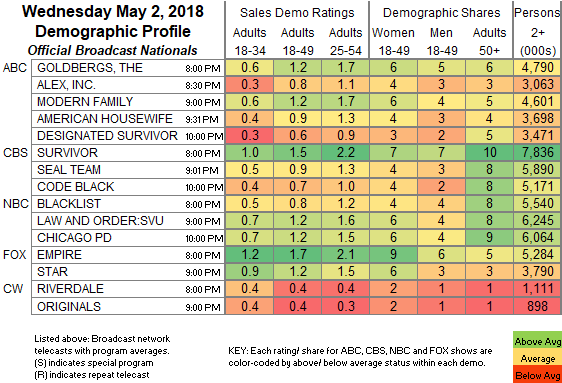 NBC: THE BLACKLIST held at 0.8. After a week off, SVU shed 0.2 to 1.2, and CHICAGO PD was steady at 1.2. CBS: SURVIVOR dipped 0.1 to 1.5, SEAL TEAM rose 0.1 to 0.9, and CODE BLACK remained at 0.7. FOX: EMPIRE (1.7) and STAR (1.2) were steady. CW: RIVERDALE (0.4) and THE ORIGINALS (0.4) stayed as-is. CABLE HIGHLIGHTS: TNT’s NBA PLAYOFFS game was at 1.60. 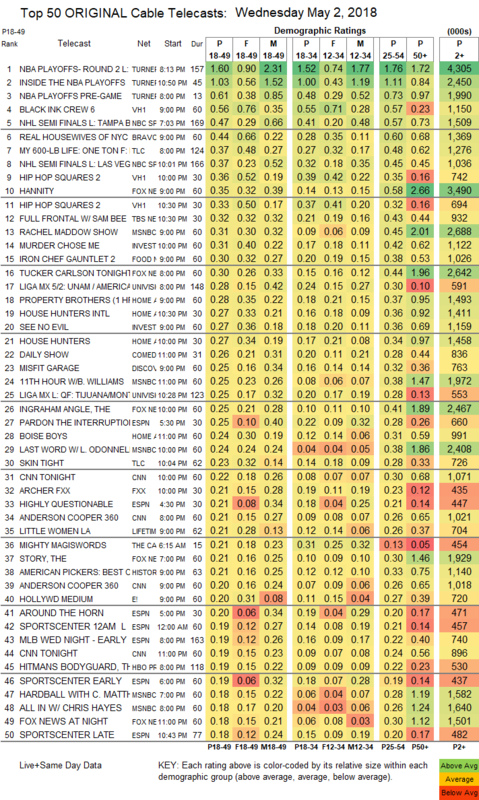 On VH1, BLACK INK CREW edged up 0.02 to 0.56, and HIP HOP SQUARES was at 0.36/0.33, compared to last week’s 0.41/0.37. NBC Sports Net’s NHL PLAYOFFS games were at 0.47/0.37. On Bravo, REAL HOUSEWIVES OF NYC slipped 0.02 to 0.44, and SELL IT LIKE SERHANT ticked up to 0.11. On TLC, MY 600-LB LIFE gained 0.03 to 0.37, and SKIN TIGHT remained at 0.23 . The night’s big news came from Fox News’s HANNITY, and it topped its category at 0.35/0.58/3.5M, above MSNBC’s RACHEL MADDOW SHOW at 0.31/0.45/2.7M, and CNN’s CNN TONIGHT at 0.22/0.30/1.1M. TBS’s FULL FRONTAL held at 0.32. On ID, MURDER CHOSE ME rose 0.02 to 0.31, and SEE NO EVIL stayed at 0.27. Food Network’s IRON CHEF GAUNTLET ticked up to 0.30. Univision’s LIGA matches were at 0.28/0.25. On HGTV, PROPERTY BROTHERS dipped 0.03 to 0.28, HOUSE HUNTERS INTL lost 0.04 to 0.27, and HOUSE HUNTERS was down 0.06 to 0.27. On Discovery, MISFIT GARAGE returned at 0.25, and STICKER SHOCK was at 0.18. FXX’s ARCHER fell 0.07 from last week’s season premiere to 0.21. Lifetime’s LITTLE WOMEN lost 0.03 to 0.21, and MY PARTNER KNOWS BEST crumpled off the chart, down 0.06 to 0.04/199K. E!’s HOLLYWOOD MEDIUM rose 0.03 to 0.20. On Syfy, KRYPTON was steady at 0.17, and THE EXPANSE was down 0.02 to 0.16. The season premiere of USA’s COLONY was at 0.16, down a big 0.13 from the 2017 premiere. FX’s THE AMERICANS ticked up to 0.15. A&E’s FLIP WARS held at 0.12. Freeform’s FAMOUS IN LOVE remained at 0.10. IFC’s BROCKMIRE dropped 0.03 from last week’s season premiere to 0.07. POP’s HOLLYWOOD DARLINGS stayed off the chart, down 0.02 to 0.01/83K.